Last Sunday I published my first blog post in Portuguese for the Meu Rio blog, in which I tell the story of how we developed our brand identity. Here is an English translation of that post. Hi, I’m Lee-Sean, and this is my first post. I’m going to tell you the story of the how we developed the Meu Rio logo and identity, but first I would like to confess something. Maybe it’s obvious, but I’m not from here. I’m neither a Carioca (native of Rio) nor a Brazilian. I was born in Taiwan, grew up in Arizona, and lived in various other places since: Boston, Barcelona, Nakatsu (Japan), New York. I consider myself a citizen of the world, and now an honorary Carioca. I arrived in Rio for the first time in 2010 along with Alessandra, co-founder of Meu Rio, and our Purpose colleague Emmy. We came to do, among other things, the preliminary research for the development of the brand identity. Before coming here, I had already made an effort to better understand Brazilian and Carioca culture: I studied Portuguese, I read books and watched movies about Rio, I listen to Brazilian music, I play capoeira. But as a gringo, I also had many stereotypical and touristic images of Rio in my head: the big Jesus statue, the Sugarloaf, the wave-patterned pavement designed by Burle Marx, the beach, Carnaval, Carmen Miranda, etc. I knew I had to avoid clichés and create an identity worthy of the Marvelous City. 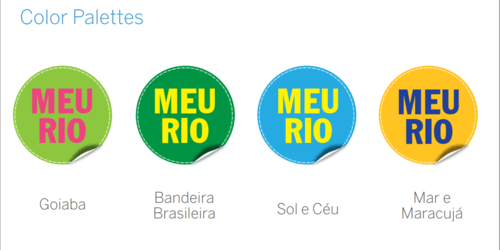 The challenge was to create a brand that respected and celebrated Rio’s cultural heritage. The first phase of our research involved total immersion. We travelled all over the city. We interviewed many Cariocas. We conducted observations and took hundreds of photos. All of this might sound like sightseeing, but really it was tiring work. Rio is full of visual delights and a city of stark contrasts between mountains and ocean, urban grey and rainforest green, modern and old, “asphalt” and favela. We found abundant sources of inspiration: the colors of tropical fruit and plants; urban street art with its rough aesthetic and perceptive social critique; the sensual curves of nature, modern architecture and the bodies of Cariocas at the beach; and the first meeting of Donald Duck and Zé Carioca. After finishing the first phase of research, we began drawing. I made several sketches. See some examples below. I tried to capture the “ginga” (swing) of the Carioca lifestyle and express the popular spirit of DIY. After deliberating, we ended up picking the current logo. Our logo subtly evokes the form of a coconut. Coconuts hydrate and nourish Cariocas and serve as an icon of Meu Rio. The irregular shape and imperfection help encourage popular participation. The “Folk” font we used for the logo was created by the Brazilian type designer Marcelo Magalhães and is licensed for reuse under Creative Commons..
By definition, a brand identity is a system of visual and stylistic rule, but at Meu Rio we aim to be more than just that. Our intention is to create a “living system” brand identity that is open to participation and remix, a brand that will grow and evolve over time, and that can easily live in online and offline contexts, in two and three dimensions. This post is about the history of the Meu Rio brand, but the story is not yet finished. We continue moving forward along with your participation. What do you think of the Meu Rio brand?